Inside HP's Antarctic Dome at Coachella. The best non-music related activation at Coachella, the HP Antarctic Dome, gave festivalgoers a break from the heat and a trippy video experience, says the head of strategy of KidinaKorner. People seeking a break from the heat (yes, the Antarctic is air conditioned) step inside a planetarium-style theater showcasing what can only be described as a video installation that simulates what it feels like to be on hallucinogens, or caters to those already on them. Music festival season is here. And that means it's time for the inevitable cliches: Girls decked in flower crowns, bros in floppy hats and brands desperately trying to fit in with the cool kids. Cue the flood of sponsored posts showing us how lit the parties were, how psyched the celebrities were to be there and how stoked the VIP attendees were to get all the coveted swag. Since Coachella kicked off, we've seen thirsty brands show us just how desperately they want our attention. But in the blink of an eye (by Coachella Weekend 2, most of these social impressions will be forgotten. The efforts vanish into the thin desert air, lacking the creativity and meaning that makes something memorable. It's time that we as an industry recognize what it takes to create a meaningful partnership in the world of music. Spoiler alert: It doesn't involve a rapper redoing your jingle or an insincere attempt to support up-and-coming artists. And it definitely does not involve signing the same artist that six other brands worked with just last year. So what does it take to make your efforts rise above the mosh pit of sponsorships, ambassadors and parties? Let's first step back and assess your objectives. If you just want reach, there are much simpler and cheaper ways to target music fans and young people (after all, they are one and the same) than getting involved with celebrities and festivals. While we're at it, let's also acknowledge that not every brand is an expert in music, and consumers don't expect you to be. Brands that are a part of culture have long held an advantage over those that aren't, and that edge has seemingly never been more important than in today's content-obsessed landscape. But while music may be the widest approach—it's the most popular form of entertainment—there are countless other arts and interests brands regularly tap into. In other words, brands are not limited to just building integrations into Coachella, Life is Beautiful or the VMAs in your communications strategy. But, if they are willing and able to play a role in the lives of fans of music, the upside is huge. After all, music does what brands want: Forms memories, stirs emotion and unites people. The HP Antarctic Dome at Coachella is a great example. 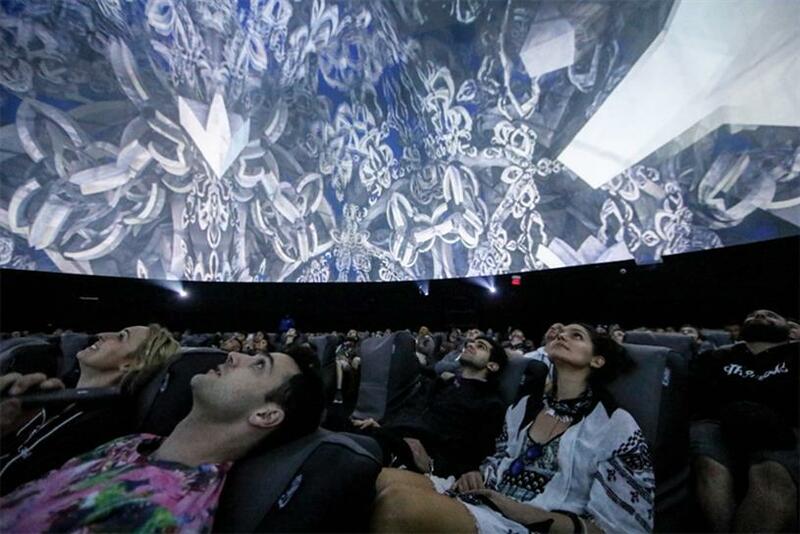 People seeking a break from the heat (yes, the Antarctic is air conditioned) step inside a planetarium-style theater showcasing what can only be described as a video installation that simulates what it feels like to be on hallucinogens, or caters to those already on them. Add a bandana design and printing station (they clearly know their audience) and some genuinely cool hands-on laser displays—all fueled by HP technology of course—and you can understand why everyone is calling it the best non-music thing at Coachella. But let's think bigger. How can brands create an experience that will resonate with consumers well beyond the latest festival? Once you land on your goals and understand the ways in which your brand can contribute to music, this is where the fun happens. One approach is to find an artist that can play well with your brand, and in the spirit of actual partnership, help them do what they do best. Nike's recent collaboration with FKA Twigs did just this. FKA Twigs, a singer and dancer, worked with the brand to concept, create and star in a recent campaign. A major departure from Nike's typical blood, sweat and tears formula for inspiration, the effort is abstract, conceptual and has almost an art-house vibe (albeit while soft-selling a $150 pair of tights). In doing so, Nike is opening its brand up to a new legion of consumers well outside the boundaries of just sports. One pitfall between brands and artists is the nature of the deals. They are almost always short-term and transactional. And you can tell. Too often, brands seem exploitive and artists are deemed sellouts. The missing ingredient is typically trust, where both parties share the same vision for success. With that kind of trust comes the opportunity to create something new and genuine. After all, that’s what the best artists, and the best brands, routinely do. Recently, Cracker Barrel and Dolly Parton formed a bond that’s led to exclusive music releases, a video content series, and a Grammy-award winning song. Late last year, the brand invited Pentatonix to join Parton in a remix of her fan favorite hit, "Jolene". In addition to 25 million YouTube views and a healthy dose of PR, the effort also got them a nod from the biggest award show in music and solidified their spot in cultural history at the 2017 Grammys. Music is memorable, emotional, and brings people together. Brands at their best can do that too. But too often, we get lost simply trying to throw the biggest festival party, or sign the biggest musician to a deal. The next time music comes up in your strategy and planning, ditch the cliches and really think about how your brand can give artists and fans the tools and experiences they truly covet. That (and in the spirit of Coachella, a rose quartz crystal) is what will really get people to pay attention. —Jared Gruner is head of strategy at KidinaKorner, a music company founded by Grammy-winning producer Alex Da Kid.